The annual classic off-road show will be returning to Telford International Centre over the weekend of February 15-16, 2020. 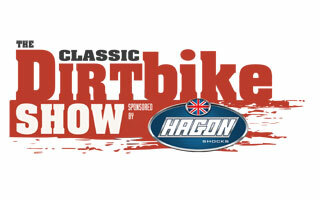 The Classic Dirt Bike Show sponsored by Hagon Shocks will once again draw in the biggest names in the off-road scene. With off-road machines as far as the eye can see, the show has dirt bike machinery to cater for every need. You’ll be able to dig out classic dirt bike machinery galore, see fascinating club and private off-road machines, bag a bargain at the autojumble and see off-road legends interviewed on stage over the weekend. It’s the event of the year for classic off-road enthusiasts! The outdoor autojumble will be opening at 9am both days. Don’t forget to take advantage of fantastic savings by buying your show tickets in advance! The exclusive three-course, sit-down dinner will be served on the Saturday evening and is expected to be another memorable occasion where guests can wine and dine with off-road legends. Price to be confirmed. Between each course, dirt bike stars will recount tales of their bike adventures to assembled guests. Why not join them for dinner? Further information will be available soon. Seats are limited and sold on a first come first served basis. Note. You do not need to have attended the Classic Dirt Bike Show to attend the dinner. Also, tickets to the dinner do not come with access to the Classic Dirt Bike Show. To attend call 01507 529 529 to book your tickets. Dinner tickets for this show will be mailed no earlier than 12 weeks prior to the event.